You may be looking for the original TechLifeBlogged. Please go to - www.techlifeweb.com - for more information from Scott Kingery. I've previously mentioned reinventing the desktop interface and the kind of changes that might be coming regarding how we use computers. I wanted to share another cool idea in this area that is simply being called a bend desk. 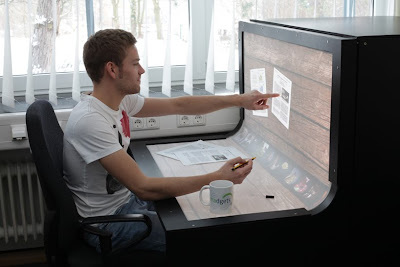 bend desk is a prototype interactive display that takes the digital workspace from the screen to the desktop by the media computing group at RWTH aachen university. while a typical work setup combines a flat desktop with a vertical computer screen, bend desk combines the two into one single unit. bend desk is a vision for a future workspace that allows continuous interaction between both areas. using multi-touch technology, the display curves from a horizontal plane to a vertical plane. this workspace can be used to display digital content and interact with it directly using multi-touch gestures and manipulation. I'd say that BendDesk is closer to being a reality. The future is now! This blog was a place-holder for Scott Kingery from TechLifeWeb managed via permission by James A. Arconati. ©2005-2011 Scott Kingery & James A. Arconati. Awesome Inc. theme. Powered by Blogger.